This is, literally, The Finishing Touch on the book. If we can achieve this goal, the HMS Pegasus Deck Plans will be printed as a double-sided 22" by 34" poster, rendered in period appropriate style; better, the trade will be revised so, at every level (Cloth Covers, The Style to Which She is Accustomed, and Rare & Royal), each copy will include a built-in pouch affixed to the inside back cover made to hold and preserve the ship blueprints. This will unify the two items as we feel they should be - the story and the ship - and add what we feel is a final touch of class and elegance to this unique edition. Two Stretch Goals at the same level? Madness! But, as Eric put it, he's going to put his mouth where you money is. Webmaster, editor, academic, and bon-vivant Eric Newsom has vowed that, should we achieve the incredible goal of reaching 150K in backing by the end of our campaign, he will, "don a pirate costume and record myself singing Better Far to Live and Die from Gilbert & Sullivan's "The Pirates of Penzance" (accompanying myself on ukelele)." He's been practicing. He has located his eye-patch, and forsaken his dignity. How can you refuse this challenge? We are stunned and delighted to have reached our initial goal with such speed. In fact, we didn't just reach it, we left it so far in the dust that we've already surpassed our first - modest - stretch goal! The Lady Sabre Paper Doll Set - This is two sheets, one with Her Ladyship and accoutrement, and a second with additional clothes, bells and whistles. This set is included with every copy of the book, and the PDFs of the two sheets are now included in the All Digital, All the Time level. You'll be able to print as many as you like! Each sheet will be single-sided, printed in full color, on 100lb matte or the nearest equivalent. The Pocket Guide to the Sphere, by Edwin Windsheer - Written by the notorious chronicler of the Sphere himself, this is a 64-page casebound book, Smythesewn, printed in black-and-white, and designed to look and feel like "the real thing." Containing essays, articles, sketches, and maps, all purportedly by Windsheer himself, this is a world-building document that provides a unique window into Lady Sabre's journeys. The book will measure 3.5" by 5" (we're serious, it's pocket-sized! ), not unlike a small Moleskine notebook. This will now be included with every pledge of $30 or higher, and the PDF version will be included in the All Digital, All the Time package. The Annotated Process of Lady Sabre - For those of you who've been reading us at ineffableaether.com, you know that we post the scripts along with each screen. Due to size constraints, we were forced to omit the scripts from the Lady Sabre Vol. 1 trade (seriously, we tried to make it work, but it would've brought the book to over 300 pages, and over $50/copy, never mind the postage). With this stretch goal unlocked, we can now go one-better - The Annotated Process of Lady Sabre is a 128-page softcover book, 6x9, containing all the scripts from Chapters 1 through 5 with notes and annotations. In addition to scripts, the book contains never-before-seen sketches and design work from both Rick and Eric, with their notes and comments, as well. This is an insider's look at the creation of our story, our world, and how we've striven to execute it. A Better Book For All - This is an across-the-board alteration to the Lady Sabre & The Pirates of the Ineffable Aether Vol. I trade. Here are the specifics. These changes will apply to every edition of the Lady Sabre & The Pirates of the Ineffable Aether Vol. I trade, regardless of edition. Case - This is the actual cover of the book. It will now be 3.5mm board wrapped in black Saifu cloth with foil-stamping on the spine and face. Endpapers - These are now to be printed on 140 GSM woodfree, to prevent cracking and damage through use and/or age, and will be printed in a 2cx2c process, meaning there will be two colors used. This will allow us - if we reach our next goal - to use one of the maps as the endpapers. Interior - Paper weight is now increased to 128 GSM matte. This will preserve the reproduction of the art and color, and prevent any bleed-through of the pages. The Cartographer's Craft - At this level, Sterling Hershey will be commissioned to create the Map of the Known Sphere as of IV.E.890 (this is our dating convention in the series). This will be a large, "flattened" map of the Lady Sabre world as it had been explored thus far. This map will be included in the Vol. I trade andwill further be the central design element of the endpapers on the book. Additionally, Sterling will revisit the maps seen in the series thus far (the Tanitin Frontier and the Coming Storm), giving them professional treatment that will also be reflected in the trade. Rick 2.0 - If we reach this level of backing, we will be able to achieve one of our most-needed goals, but one we've been frankly reluctant to consider. The fact is, Rick is working on tragically out-of-date equipment, working in an analogue fashion on a digital product. His computer needs upgrading, but more crucially, the small Wacom tablet he's been using since we began is in need of replacing. We want to set Rick up with a new Cintiq monitor and accompanying system. Doing this will not only allow Rick to increase the speed at which he works, but will result in, we believe, a visible enhancement to all our visuals, from the webcomic to the printed trade, and all stops in-between. HMS Pegasus Deck Plans - If we achieve this Stretch Goal, Sterling Hershey will bring to life Her Ladyship's conveyance with a set of deck plans of Pegasus. Working with Rick and Greg, this will be a minimum of four sheets or their equivalent, detailing each deck of the ship, and potentially as many as eight, showing detail, cut-aways, and close-ups. These will be printed on high-quality paper, in a "blueprint" style, and designed to replicate the ship plans of the era. A complete set of these deck plans will be included with every copy of the book (Cloth Covers, The Style to Which She is Accustomed, and the Rare & Royal editions) as well as be included in the All Digital, All the Time package. Your support and backing has been so overwhelming, we are now able to include a copy of The Annotated Process of Lady Sabre as well as The Pocket Guide to the Sphere with each edition of the trade. Presenting the first trade collecting Chapters One through Five of the webcomic Lady Sabre & The Pirates of the Ineffable Aether in a 192-page, full-color, hardcover edition. 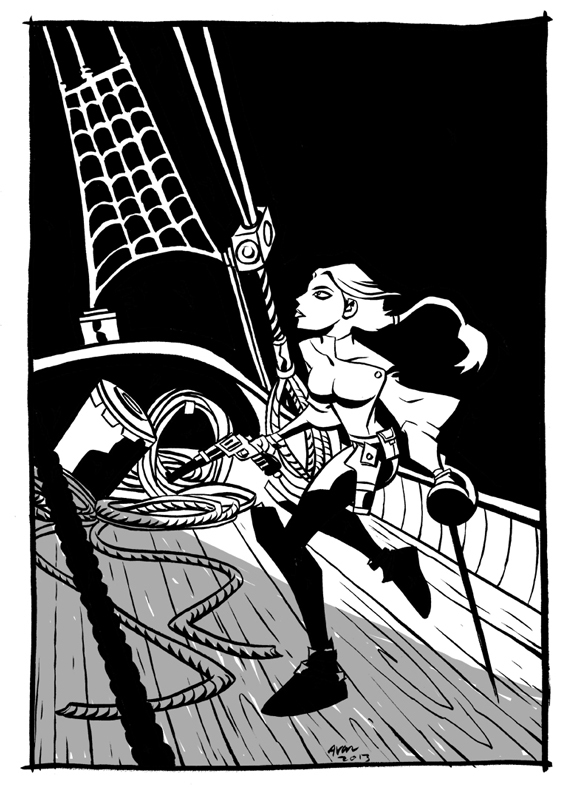 Lady Sabre & The Pirates of the Ineffable Aether is a webcomic created by Eisner Award winners Rick Burchett (The Batman and Robin Adventures, The Superman Adventures, Blackhawk, She-Hulk) and Greg Rucka (Whiteout, Stumptown, The Punisher, Detective Comics, Queen & Country, Alpha). Rick handles the beautiful art and Greg provides the story and the words. The whole work is overseen by editor, designer, and web-guru Eric Newsom. Lady Sabre's world is one of danger, adventure, and deception, filled with clockwork monstrosities, dire magic, and noble hearts. It is a world flavored by Victorian England and late 19th century Europe and the Old West. It is a world of cannon fire and steel meeting steel, brass gears meshing seamlessly with steam-driven pistons, a world of passion and humor and a dash of romance. As for Rick and Greg, they met many a year ago while working for DC Comics, putting the Dark Knight through his paces atop the roofs of Gotham. A long friendship was born in the discovery that they shared many of the same passions in comics and novels and movies. They loved westerns, pulps, steampunk, sci-fi, serials, you name it, they dug it. Very early on, they decided they needed a place to tell stories all their own, full of the glee and joy that infused so many of their shared influences. Ultimately, they created the Lady Sabre webcomic as a means to that end, a way to pursue the characters and stories they wanted to tell, without restraint or censure. Video by Nicholas Rucka and Maboroshii Productions. Lady Seneca Sabre is the 14th Marchioness of Cascadia, and captain of the good ship Pegasus. Her Ladyship is at once spy, thief, swordsmaster, (minor) witch, author of scandalous erotica, and gifted with the violin. Her Ladyship, as she is the first to tell you, is just generally fabulous. She sails the Aether — a near-endless expanse of unfathomable near-emptiness — between floating Lands in pursuit of glory, gold, a dash of magic, and her own, unknown, agenda. Along her way, she encounters villains, rogues, madwomen, and two stalwart defenders of the law - the Marshal Miles Drake, and his Deputy Keyton Drum. Lady Sabre & The Pirates of the Ineffable Aether, Volume I, is the first collection of the strips - or more precisely, “screens” - published on the website www.ineffableaether.com. This is a 192-page hardcover collection that covers the first five chapters of our epic, plus bonus content, and is the first part of what will ultimately comprise "The First Book of Sabre." This campaign exists to fund the Exclusive Kickstarter Edition of this trade. This collection will contain all of the screens comprising our first five chapters, beginning with a rather fabulous swordfight atop a zeppelin, and including a gunfight with some tough hombres in a one-horse town, a meeting with a witch, the revelation of a map that will Change the Face of the World, and the subsequent discovery of those malevolent forces seeking to thwart Her Ladyship in her quest. It’s a lot, honestly, it's over 160 pages of comic already completed and ready to go, and - as you might expect - it's also a wonderful introduction to our world, our story, and our adventure. Mock-up of the case, without jacket, showing spine. This edition will also include material from the Almanac that is maintained on the website, with entries explaining the world of the Sphere, as well as Kickstarter-specific content, including pin-ups from many amazing and established artists; an exclusive short-story written by Greg; and a brand new article, “The Legend of Lady Sabre,” written by the notorious chronicler of the Sphere, Edwin Windsheer. Mock-up of interiors as laid out. “Landscape” orientation, to preserve the size and composition of the original art, at 11" by 8.5". Printed on 120 GSM matte, to reproduce the color and tone of the original art. Hardcover (cloth) with foil stamping on the spine and cover for added elegance. Jacketed, with a wrap-around cover on semi-gloss in full color, featuring all-new artwork by Rick Burchett. This, as you can imagine, will be a hefty volume, suitable for reading, looking quite impressive on your coffee table or bookshelf, or repelling boarders if required. One of the pin-ups, contributed by the amazing Karl Kerschl. Pay for our initial print run of 2000 copies. Pay for shipping supplies, postage, and labor. Cover fees incurred by Kickstarter and similar attendant charges, including credit card processing and taxes. We recognize that we're not asking for a modest amount. This is not a modest project. Publishing costs money, and the nicer the book, the greater the cost. We want to make a very nice book, indeed, one that we're proud to call ours, and one that you'll be proud to do the same. Our men of the Tanitin Easterly, Drake and Drum, in action. Should you be so generous, and we be so fortunate, as to exceed our initial fundraising goal, the extra money will go back into the production of the trade, increasing the print-run, continuing work on the webcomic, and towards future collections. We also have several stretch goals planned. Any extra monies raised will also go to defray the expenses incurred in the first 18 months of production of the webcomic, and, maybe, buy Rick a new computer so he doesn’t have to work on something that was new in 2003 and that wheezes every time he boots it up. That’s the column to your right. Take a gander. This is our first attempt at a Kickstarter, and we are fully committed to its success and to bringing this book to your hands. Your assistance in spreading the word about our campaign via Twitter, Tumblr, Facebook, or megaphone atop mountain, would be gratefully appreciated. New Tiers Added - Original Pin-Up Art from Nicola Scott and Kyle Latino. The Style to Which She is Accustomed - New edition of the trade now being offered, with multiple tiers incorporating bookplate, inscribed, and remarqued copies. Mock-up of this edition now visible below previous mock-up. Add-Ons Revised - List revised to include more options. Also, you guys are AWESOME and we continue to be overwhelmed by your support and encouragement. Add-On section now included beneath Stretch Goals. As designs are finalized for our rewards, we will post them here for all to see! Optimystical Studios prototype for Lady Sabre "dog tag" pendant, face. Optimystical Studios prototype for Sabre Keychain, facing side. Here's the revised Add-On List. It is likely (though not guaranteed) that we'll be offering additional items and services through this list, including new items not included in the Rewards, as the campaign moves forward. Add-On - Any single Tintype-Style Portrait - $5 (You will be asked to specify which character via Survey following the end of the campaign). The book is already laid out. Touch-ups and corrections on artwork are being completed, and all other content has either already been created, or is in the process of being written at this moment. As with all endeavors, though, we cannot account for… well, the unaccountable. Delays may occur in production, shipping, or the like. As it stands now, if this project is successfully funded, we'll be seeing production of much of the premiums during the summer (ie, Convention Season, for those of us in the comics industry), and this may lead to minor delays. In the event of any such instances, we will keep all of our supporters informed through updates via Kickstarter, Twitter (@IneffableAether), and the Lady Sabre & The Pirates of the Ineffable Aether Facebook page. THE BOOK IN DIGITAL - This will be a DRM-free PDF of the actual hardcover, and will include all the same content of the physical book, but, obviously, be practically weightless. TINTYPE PORTRAIT - HER LADYSHIP - You receive the DRM-free digital version of the trade, as well as a period-style portrait of Lady S, as drawn by Rick. Sepia tones rule! TINTYPE PORTRAIT - THE MARSHAL - You receive the DRM-free digital version of the trade, and a period-style portrait of Marshal Miles Drake, he of stony gaze and lightning hands, drawn by Rick. TINTYPE PORTRAIT - THE TRACKER - You receive the DRM-free digital version of the trade, along with this period-style portrait of the Tracker, Keyton Drum, drawn by Rick. Drum's enigmatic smile is included at no extra cost! ALL DIGITAL, ALL THE TIME - You get the book in DRM-free PDF, along with all of our other digital options, a wallpaper and icon pack, and a copy of the exclusive interview conducted by John Siuntres of WordBalloon (http://wordballoon.blogspot.com/) with Rick, Greg, and Eric. THE BOOK IN CLOTH COVERS - Everything from the $20 tier, and the much-heavier actual physical book. This is what the campaign is all about. PLATED - Everything to the $30 level, plus your copy will come with a limited edition, Kickstarter-only bookplate designed by Rick. Each bookplate is numbered, and signed by both Rick and Greg. INSCRIBED - You will receive everything to the $40 level, plus Greg will personally inscribe your copy of the book to you or the person of your choosing. CHAINED - You will receive everything to the $50 level, plus a limited edition Lady Sabre keychain as designed and produced by the fine artisans of Optimystical Studios (http://www.optimysticalstudios.com/). COWPOKE - Everything to the $50 level, plus you've earned a place with the Tanitin Regional Authority, and two fully-embroidered patches (designed by Rick) prove it; a Tanitin Marshal Service Patch, and a Tanitin Regional Authority Tracker Patch, plus a Letter of Authorization signed by Crooked Judge Modeste D'Arrabas. PRIVATEER - Everything to the $50 level, plus you've taken the Queen's Whole and now sail the Aether for the Glory of the Rose. Two fully-embroidered patches (yes, designed by Rick!) demonstrate your devotion; The Crest of Allyria and a Pegasus Crew Patch, plus your very own copy of Lady Sabre's Letter of Marque, signed by the Rose herself. THE STYLE TO WHICH SHE IS ACCUSTOMED - Those Cloth Covers not enough for you? Rare & Royal too rare? This edition of the trade will have identical content as the others, but features a hardcover printing treatment meant to replicate the style and fashion of Victorian/Edwardian-era hardcovers, along with ribbon bookmark. The book will be jacketed, if you're the type who desires more... discretion in your hardcovers. THE STYLE TO WHICH SHE IS ACCUSTOMED - PLATED - All the glory of the $80 Tier, but with the Kickstarter-only bookplate, numbered and signed by Greg and Rick. A WORTHY ENDEAVOR - Everything to the $50 level, plus your choice of either Cowpoke or Privateer, and the Lady Sabre dog-tag featuring Her Ladyship's distinctive silhouette on one face, her motto "Hold fast!" on the other, created by the fine artisans of Optimystical Studios. THE SENTIMENTAL JOURNEY - A walk down memory lane, in the form of copies of pretty much every comic Rick and Greg have ever produced together - Batman/Huntress: Cry For Blood (6 issues); Detective Comics 757 ("Air Time"); The Batman 10-Cent Adventure; Legends of the Dark Knight 125; and Queen & Country: Declassified III (3 issues). This reward includes the INSCRIBED level. THE STYLE TO WHICH SHE IS ACCUSTOMED - INSCRIBED - Everything from the $90 Tier, but Greg will personally inscribe the book to you or the person of your choosing. SURF & TURF- Everything to the $50 level, plus both the Cowpoke AND Privateer options are yours. Can't decide if you're a landlubber or an old salt? Now you can be both! RARE & ROYAL - This is a limited, prestige edition of the trade, bound in imitation leather with ribbon bookmark, foil-stamped on the front case and spine, and enclosed in its own foil-stamped slipcase. Each copy is numbered, and signed by Greg and Rick. This is the book as we imagine it sitting on Her Ladyship's shelf. Backers at this level also receive the Lady Sabre dog tag crafted by Optimystical Studios, as well as all the digital options. RICK'S REMARQUE - Everything to the $50 level, but your copy of the book will be individually remarqued by Rick; this will be an original sketch of Rick's choosing on the title page of your copy, personalized to you or the individual of your choosing. OBJET D'ART - Everything to the $50 level is yours, plus you will receive an Optimystical Studios framed 1 1/8" pendant in silver, enclosing a cameo-style original character portrait by Rick. This is a one-of-a-kind piece of art that you can wear of the character of your choice. YOUR REMARQUE - Everything to the $50 level, but your copy of the book will be individually remarqued by Rick; this will be an original sketch of YOUR choosing on the title page of your copy, provided that Rick is willing to draw it. Lady Sabre writes erotica; she doesn't perform it. Or if she does, she certainly doesn't speak of it. A Lady never tells. THE STYLE TO WHICH SHE IS ACCUSTOMED - RICK'S REMARQUE - Everything included in the $100 Tier of this edition, and Rick will remarque your copy with a pencil and ink sketch of his choosing. RED SHIRT - Everything to the $50 dollar level, plus your likeness will appear in the comic at some point during Book 2 (which will begin roughly late early-to-mid-2014). You probably won't talk, you'll definitely be seen, and in case you hadn't guessed by the color of your shirt, you'll likely end up dead in a pool of your own blood. Ignobly. THE STYLE TO WHICH SHE IS ACCUSTOMED - YOUR REMARQUE - Everything included in the $100 Tier of this edition, and Rick will remarque your copy with a pencil and ink sketch of YOUR choosing. BLUE SHIRT - Everything to $50 dollar level, and your likeness will appear in the comic at some point during Book 2 (see above for dates). You will have a speaking role, and you might live. For a while, at least. 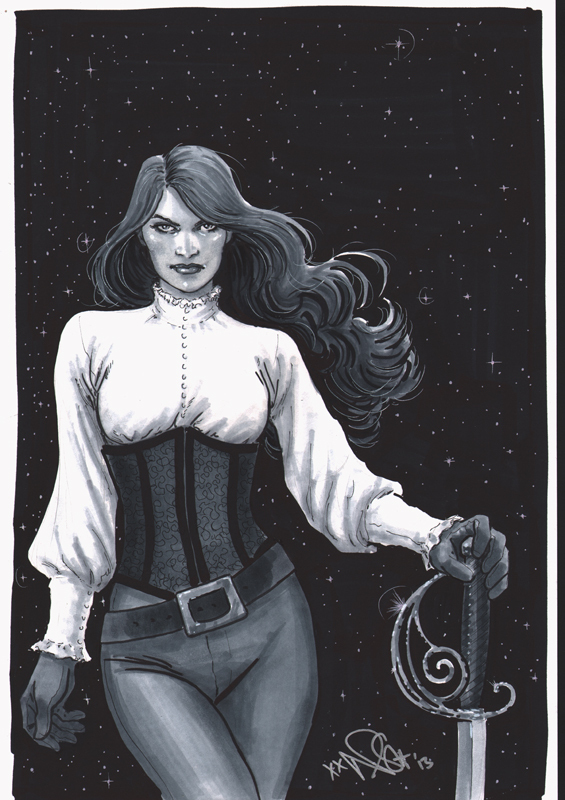 ORIGINAL PIN-UP ART - MATTHEW CLARK - This is a one-of-a-kind item, the original pen and ink drawing done by Matthew Clark for inclusion in the Lady Sabre Vol. I Pin-Up Gallery. You receive Matthew's original piece, as well as The Style to Which She is Accustomed - Plated - edition (and all the digital add-ons, and the additional books, yada yada). ORIGINAL PIN-UP ART - MICHAEL AVON OEMING - This is a one-of-a-kind item, the original pen and ink drawing done by Michael Oeming for inclusion in the Lady Sabre Vol. I Pin-Up Gallery. You receive Michael's original piece, as well as The Style to Which She is Accustomed - Plated - edition (and all the digital add-ons, and the additional books, yada yada). ORIGINAL PIN-UP ART - NICOLA SCOTT - This is a one-of-a-kind item, the original pen and ink drawing done by Nicola Scott for inclusion in the Lady Sabre Vol. I Pin-Up Gallery. You receive Nicola's original piece, as well as The Style to Which She is Accustomed - Plated - edition (and all the digital add-ons, and the additional books, yada yada). 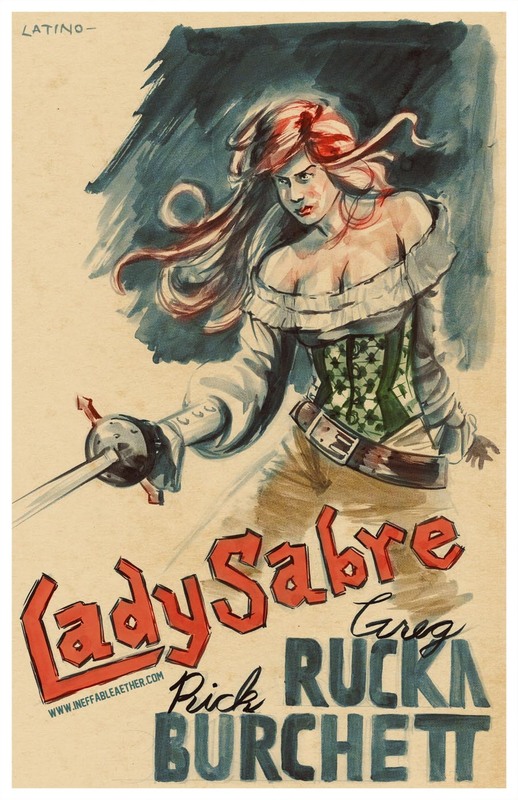 ORIGINAL PIN-UP ART - KYLE LATINO - This is a one-of-a-kind item, the original pen and ink drawing done by Kyle Latino for inclusion in the Lady Sabre Vol. I Pin-Up Gallery. You receive Kyle's original piece, as well as The Style to Which She is Accustomed - Plated - edition (and all the digital add-ons, and the additional books, yada yada). ORIGINAL PIN-UP ART - KARL KERSCHL - This is a one-of-a-kind item, the original pen and ink drawing done by Karl Kerschl for inclusion in the Lady Sabre Vol. I Pin-Up Gallery. You receive Karl's original piece, as well as The Style to Which She is Accustomed - Plated - edition (and all the digital add-ons, and the additional books, yada yada). ORIGINAL PIN-UP ART - SCOTT WEGENER - This is a one-of-a-kind item, the original pen and ink drawing done by Scott Wegener for inclusion in the Lady Sabre Vol. I Pin-Up Gallery. You receive Scott's original piece, as well as The Style to Which She is Accustomed - Plated - edition (and all the digital add-ons, and the additional books, yada yada). Please note, this is the black-and-white art, not the version as it will appear in the trade, colored by Lindsay Small-Butera. ORIGINAL PIN-UP ART - STEPHANIE BUSCEMA - This is a one-of-a-kind item, the original painting done by Steph Buscema for inclusion in the Lady Sabre Vol. I Pin-Up Gallery. You receive Steph's original piece, as well as The Style to Which She is Accustomed - Plated - edition (and all the digital add-ons, and the additional books, yada yada). QUEEN & COUNTRY DECLASSIFIED II - PAGE 9 - Freshly promoted Special Operations Officer Tom Wallace is sent to Hong Kong just before the colony is returned to China to investigate the mysterious death of an agent. He crosses paths with a Hong Kong police detective, as desperate to solve the crime as he. Page will be signed by Rick and Greg, and will come with a copy of the issue in question, as well as the Cloth Covers edition of the trade, and the full digital package. QUEEN & COUNTRY DECLASSIFIED II, PAGE 11 - Having put away their guns, Wallace and Detective Mei find a teashop and have a chat in an obvious homage to John Woo's "Hard Boiled." Page will be signed by Rick and Greg, and will come with a copy of the issue in question, as well as the Cloth Covers edition of the trade, and the full digital package. RETAILER EXCLUSIVE - 10 copies of the collection, each signed by Rick & Greg, plus 10 sets of the Lady Sabre Triptych prints (Lady Sabre, Marshal Drake, and Keyton Drum) designed and illustrated by Rick, and signed by Rick & Greg. "Passings." Bruce Wayne's bodyguard Sasha Bordeaux, forced upon him by the Board of Directors of Wayne Enterprises, has discovered what he's up to at night, and even though he's the Batman, she still insists on doing her job. To do so, she must follow Batman's instructions and join him in his vigilante activities. This story is her first night "on the job." This means she has to leap off of a skyscraper. She is… reticent. Page will be signed by Rick and Greg, and will come with a copy of the issue in question, as well as the Cloth Covers edition of the trade, and the full digital package. "Passings." Bruce Wayne's bodyguard Sasha Bordeaux, forced upon him by the Board of Directors of Wayne Enterprises, has discovered what he's up to at night, and even though he's the Batman, she still insists on doing her job. To do so, she must follow Batman's instructions and join him in his vigilante activities. This story is her first night "on the job." Having leapt, Sasha lands, and discovers what every costumed hero of Gotham City already knows - you can't buy that kind of adrenaline rush. Page will be signed by Rick and Greg, and will come with a copy of the issue in question, as well as the Cloth Covers edition of the trade, and the full digital package. BATMAN 587, PAGE 3 - "Officer Down, Part One - These Are Your Rights." The start of the Officer Down storyline. It's the end of a long day on the job for Commissioner Gordon and also, coincidentally, his birthday. A quiet moment between Gordon and the Dark Knight to set the stage for the story to come. Page will be signed by Rick and Greg, and will come with a copy of the issue in question, as well as the Cloth Covers edition of the trade, and the full digital package. BATMAN: THE 10-CENT ADVENTURE, PAGE 6 - "The Fool's Errand." This was a promotional book - as you can tell by the cover price - designed to give insight and articulation to just who Batman is in the then-current DC continuity. This is actually one of my favorite stories that I wrote, and one that Rick executed beautifully, I thought. It's simply "an average night" for Batman, as seen through the eyes of Sasha Bordeaux. Page will be signed by Rick and Greg, and will come with a copy of the issue in question, as well as the Cloth Covers edition of the trade, and the full digital package. BATMAN 587, PAGE 13 - "Officer Down, Part One - These Are Your Rights." The start of the Officer Down storyline. In this scene, Commissioner Gordon is speaking to his best detectives - the Major Crimes Unit, many of them who were featured in Gotham Central. This storyline was the only time, to my knowledge, that Rick drew the Gotham Central detectives. Page will be signed by Rick and Greg, and will come with a copy of the issue in question, as well as the Cloth Covers edition of the trade, and the full digital package. GOTHAM KNIGHTS 13, PAGE 3 - "Office Down, Part Seven - The End." The conclusion of the Officer Down storyline, culminating in Commissioner James Gordon's decision to retire. Another rare moment of Rick drawing the MCU detectives, in particular Greg's favorite partner pair of Renee Montoya and Crispus Allen. Page will be signed by Rick and Greg, and will come with a copy of the issue in question, as well as the Cloth Covers edition of the trade, and the full digital package.